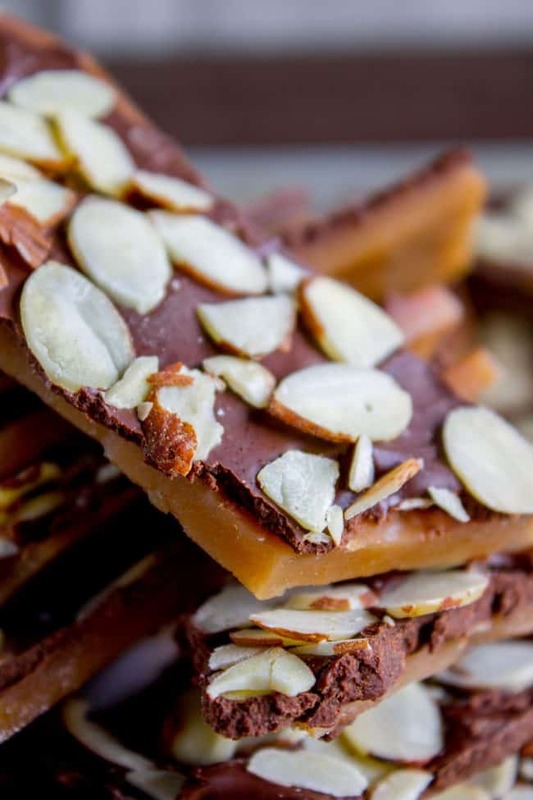 This is the BEST homemade English Toffee Recipe, hands down! 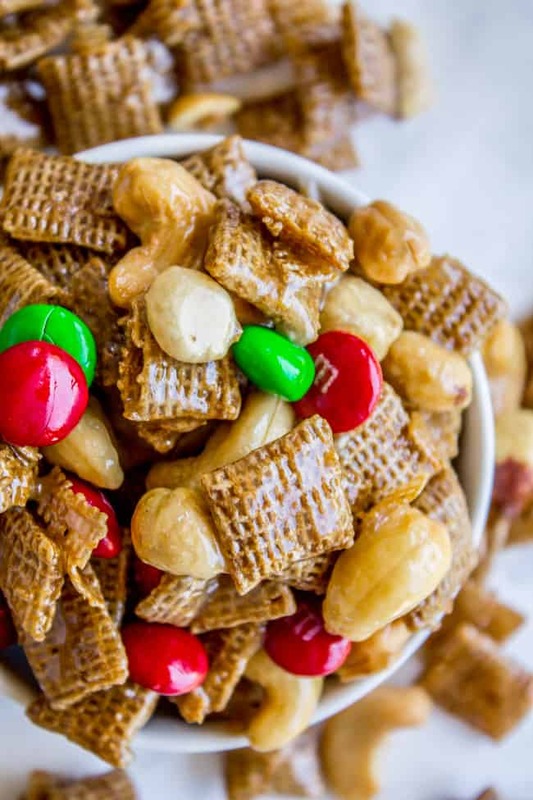 This is such an easy and QUICK treat to make for the Christmas holidays. You don’t even need a candy thermometer! We have two sheet pans, one that is 10 years old and the other one I just bought a few months ago (I really don’t know how I got by with just one actually.) Eric told me that the poor new sheet pan was probably traumatized when it got settled in our kitchen. Like, if there was a kitchen version of Toy Story. New Pan Guy comes in all sparkling and clean, thinking it’s going to be a jolly time in this new home. Then he sees the state of the other pans and is struck with terror, “Oh my gosh, what did she DO to you? ?” I am Sid in this story. How is Christmas prep going? Are you all done shopping? Sent the Christmas cards? Planned the menu? Lit up the house and tree?? (There is so much to do, I love it all!) Have you passed out neighbor gifts yet? Lucky for you I’ve got a last minute solution: stellar homemade toffee takes about 15 minutes start to finish. Yes, real toffee, no cheat stuff. This is real candy and it’s really amazingly easy, I promise. The thing about candy is that there are some ground rules. Things like, use a heavy pot, don’t let sugar granules get on the edge while cooking, and totally concrete instructions like, “When it reaches an amber color.” I’m sorry but when was the last time you saw what color amber actually was. It sounds intimidating but it’s really not that bad. Here’s the breakdown: use a heavy pot so that your candy cooks evenly. Don’t get sugar granules on the edge of the pan or it could crystalize the candy (meaning it won’t turn into toffee). 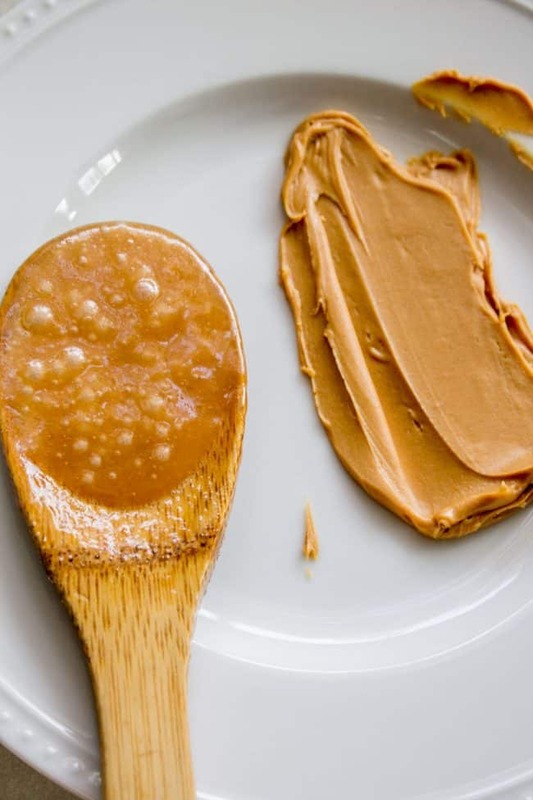 And finally, stop cooking when it looks like peanut butter, not amber, silly. Okay, okay, so I’m an annoying color-test hypocrite. But really…the peanut butter color test totally works. There is NO PEANUT BUTTER in this recipe, I repeat, this is not Peanut Butter Toffee. 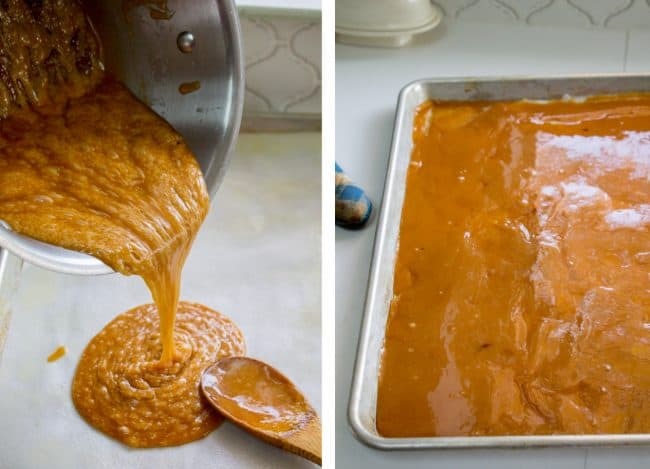 This is another Aunt Shirley recipe, and her instructions include no temperature levels, but instead say to get out your jar of peanut butter, set it next to the stove, and when the candy in the pot turns the same color as the peanut butter, it’s done. Pour that sugar right in the middle. I like my toffee to stop cooking right in between soft crack and hard crack stages. See?? It looks just like peanut butter! Have I scared you off?? Come baaaack! 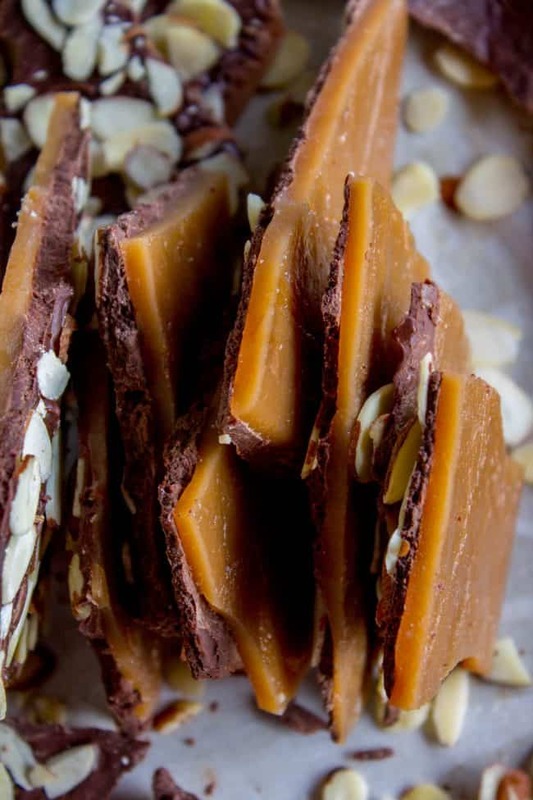 This English toffee recipe is totally worth making, even if you have to remember a few pesky rules. I still remember the first time I had homemade English toffee. It was a neighbor gift from my friend Joan at our old house. She had dozens of little bags of toffee to hand out to friends, and I think I ate our family’s whole bag without sharing (sorry Eric). I fell in love with homemade toffee that day and now I’m so happy to be able to make it on my own! Merry Christmas everyone! 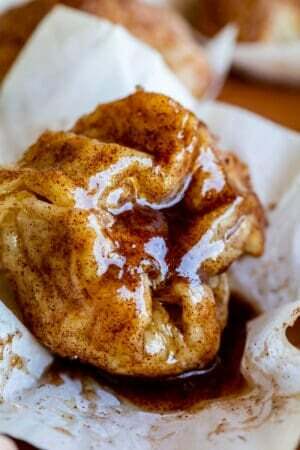 Let me know if you try out the recipe, I love hearing from you! Two years ago: Overnight Biscuits and Gravy Casserole << Christmas morning, make it! 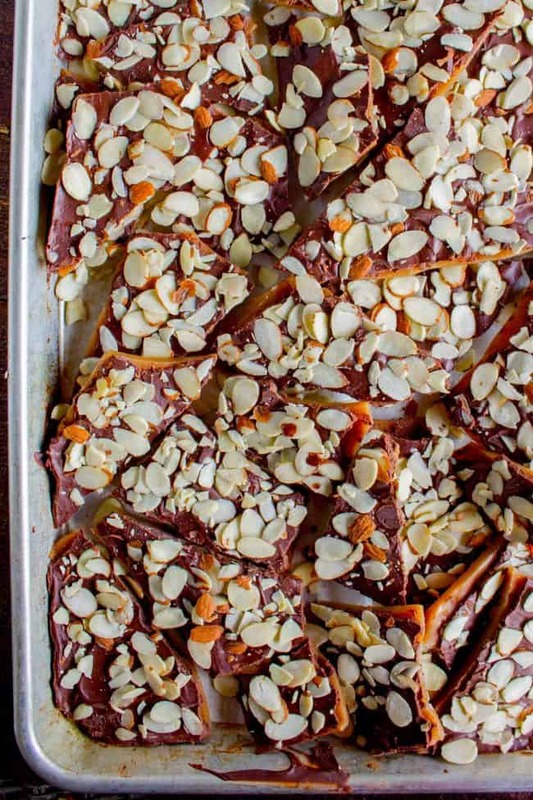 This is the BEST recipe for English Toffee, hands down! This is such an easy and QUICK treat to make for the Christmas holidays. You don't even need a candy thermometer! Start by coating an 11x17 inch baking pan with nonstick spray. 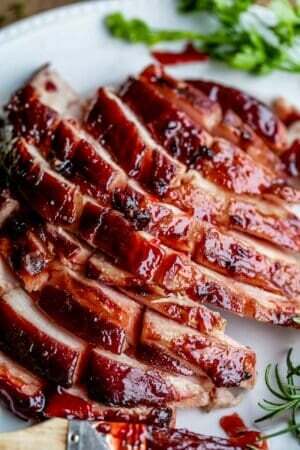 Or use your fingers to coat it with a bit of butter. You can use parchment paper if you want but I actually found that it wasn't necessary. I tested this recipe with and without a candy thermometer, and my toffee looked like peanut butter at about 285-290 degrees F. Hard crack stage is 300 degrees, and you can certainly go that high if you want. See, there is wiggle room, even in candy recipes! I would rely more on the color of the toffee though. The peanut butter trick really does work great. Remove the pot from the stove and QUICKLY pour it into the prepared pan, scraping the edges. 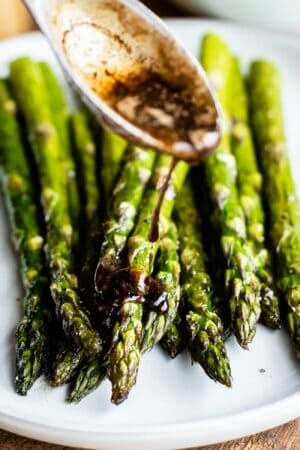 Use a spatula to spread it out as soon as possible. You don't need to go to the edges of the pan, although you can. Wait 4-5 minutes for the chocoalte chips to melt. If you were too slow and your chocolate isn't melting, then stick it in the oven at 350 for 2-3 minutes, or however long it takes to get the chocolate chips just barely melted. Then use an offset spatula to spread the chocolate to the edges of the toffee. Sprinkle right away with sliced almonds. You can use your hands to gently press the almonds in; whichever ones are not touching melty chocolate are just going to fall right off. Let the pan cool for 1-2 hours. You can speed this up by sticking it in the fridge, but if you do this will MUST wait until the toffee returns to room temperature before breaking it up, otherwise it will be too brittle and just break into sad toffee crumbs. Store in a ziplock or tupperware on the counter. Try not to eat it all at once. *You can use any kind of nut that you like! 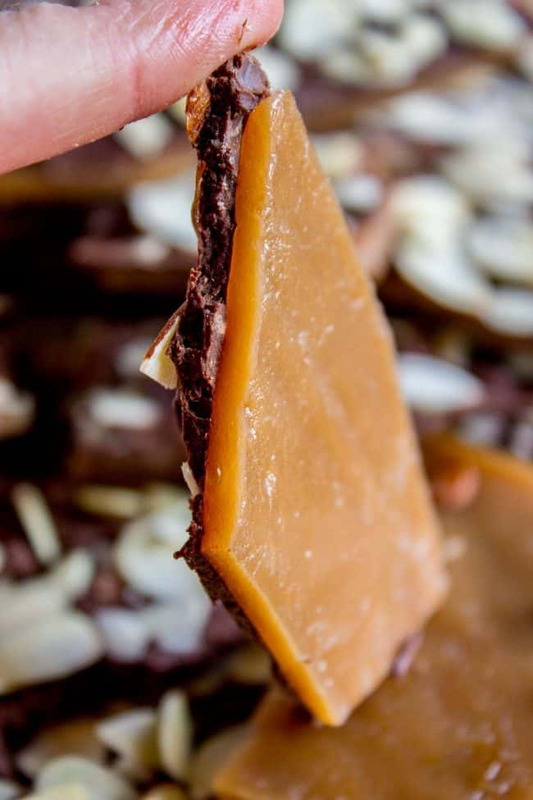 Traditional English Toffee has nuts that have been chopped by hand, usually almonds, pecans, or walnuts. I think they would all taste amazing! I want to try walnuts next. My neighbor made English Toffee for me with sliced almonds one time and I became obsessed, so that's why I chose to do it. Plus, hello, super easy, open the bag and dump. 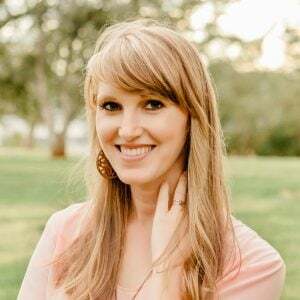 **My mother-in-law Kris told me about the two methods she uses to make SURE there are no sugar granules on the edge. One is to cover the pot for a minute or two right when the mixture reaches a boil. This will cause steaming on the edges of the pot, melting the sugar (then uncover and stir, stir!). The other solution is to use a damp pastry brush to wipe the edges of the pot. 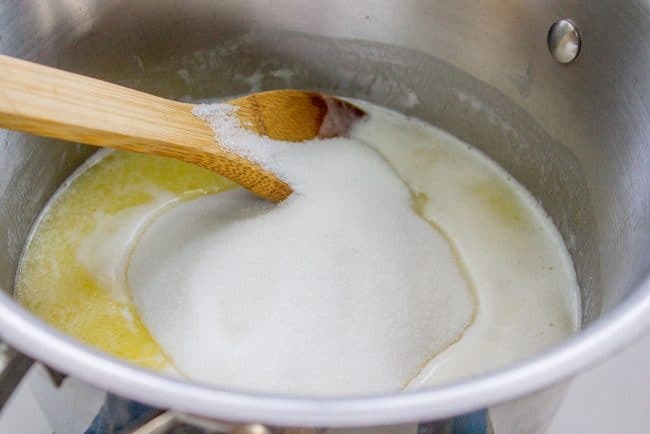 I've never tried either method because I was pretty careful on all of my 4 tests for this recipe that I did not get sugar on the edge of the pot. But Kris has made a LOT more candy than I have, so trust this tip. 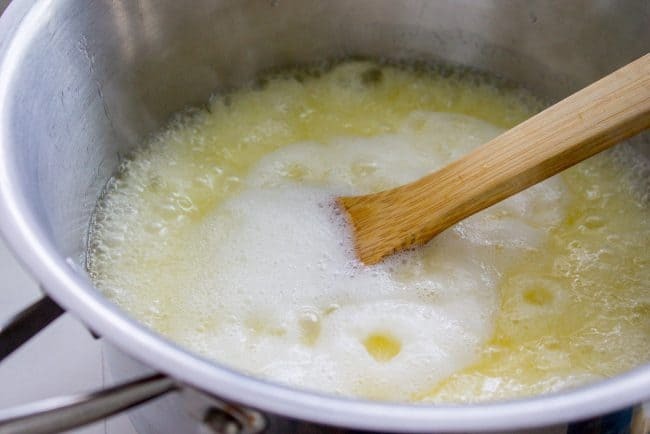 This hasn't happened to me, but it is a common problem for the butter to separate from the toffee (like a layer of melted butter on top of the caramel, while still in the pot, that won't mix in). This is the result of rapid temperature changes (thin, flimsy pots have hot spots. No bueno.) and also from not stirring enough. So get a heavy pot and be ready to stir for 10 minutes or so. 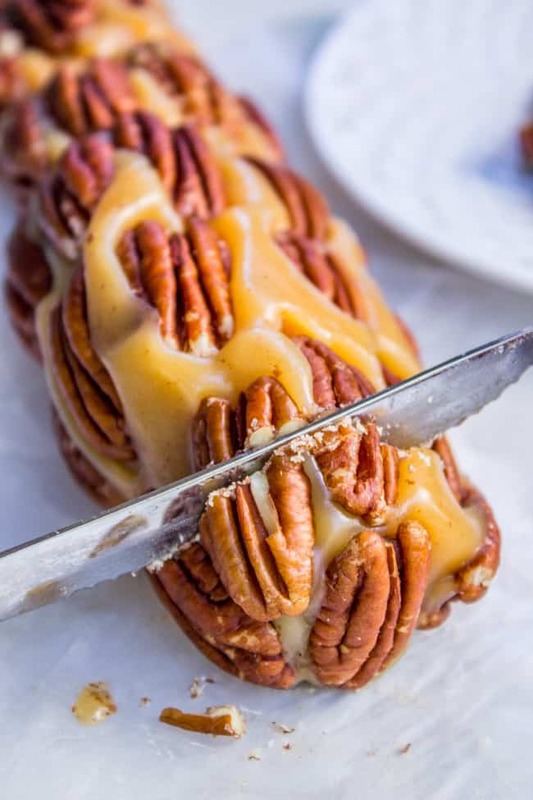 Caramel Nougat Pecan Rolls << I adore these! 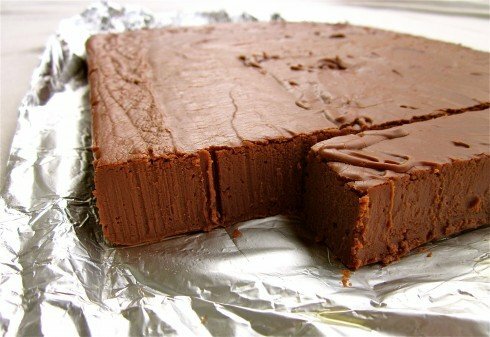 My Mom’s Fudge << a classic. 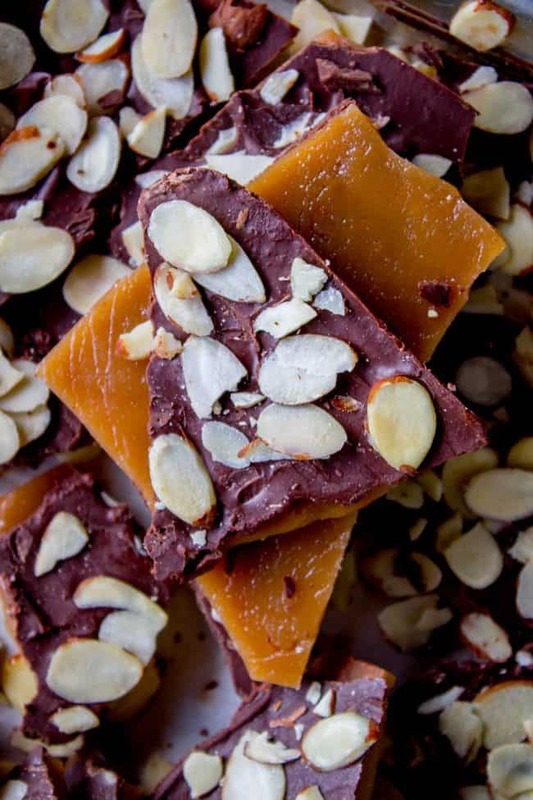 More toffee from blog friends! This toffee looks beautiful. I think it would make a great dessert garnish too- maybe broken pieces on top of a cake. ooh now that’s a fabulous idea!! Oh yeah. .. only a chocolate like this can cure a chocolate fix! Making it tomorrow! 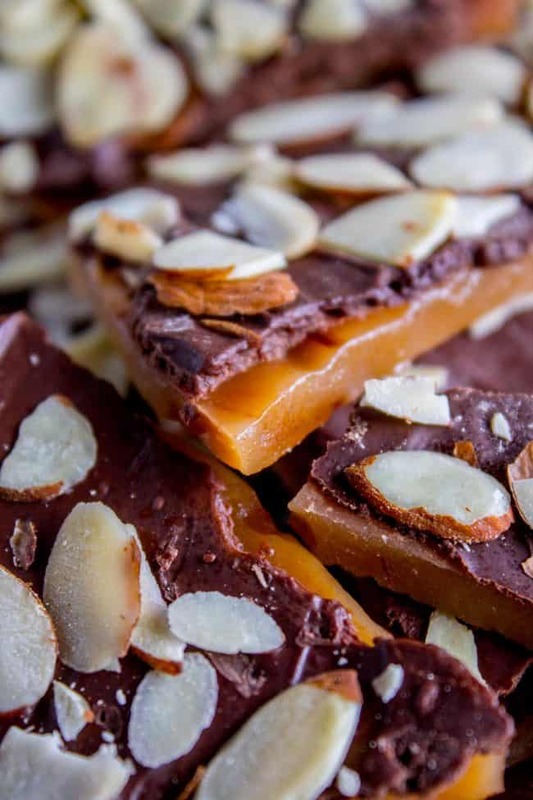 My mother in law taught me how to make toffee when I was a newlywed and I make some every Christmas. 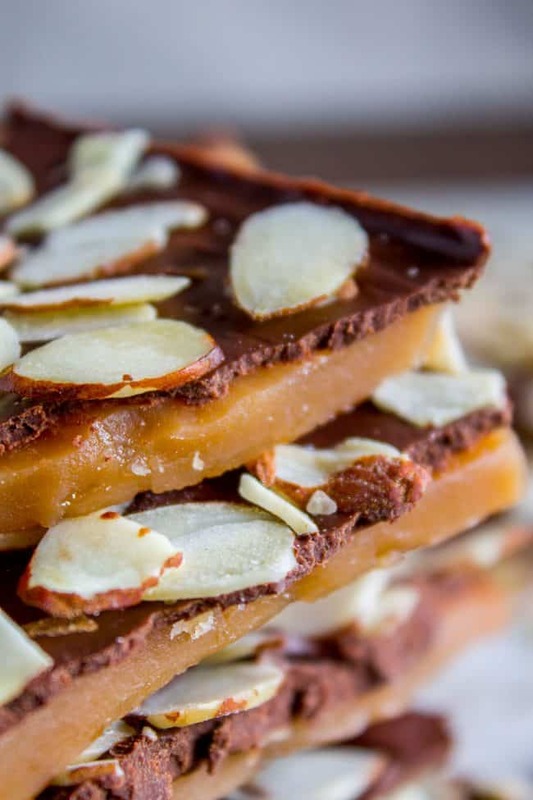 Her recipe calls for almonds in the toffee and walnuts on top…delicious! She always went by color, too, though I’ve never used the peanut butter test but will from now on! I had some trouble a few years ago and finally discovered it was because I used unsalted butter. The consensus on the Internet seemed to be that the salt helps stabilize the candy. So I always use salted butter and add a little salt. 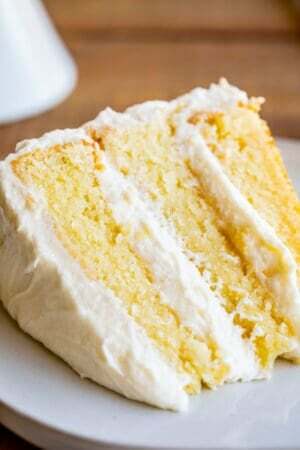 Thanks for your awesome recipes! Oh interesting Laura! I didn’t know that about the salt! I always use salted butter so I’ve never had issues, thanks for the info. I want to try adding nuts to the pan before pouring the toffee next time! Sounds so good! Oh, I never tried anything like this to be honest – must be extremely good ^^ Thanks a lot for sharing it with us, although it doesn’t seem easy to prepare. Wish me luck, hopefully I will manage! It actually is pretty easy Carla! I hope you love it! You know Becky, I think that this probably just has to do with the temperature, it either being too low or too high when you take it off the heat. 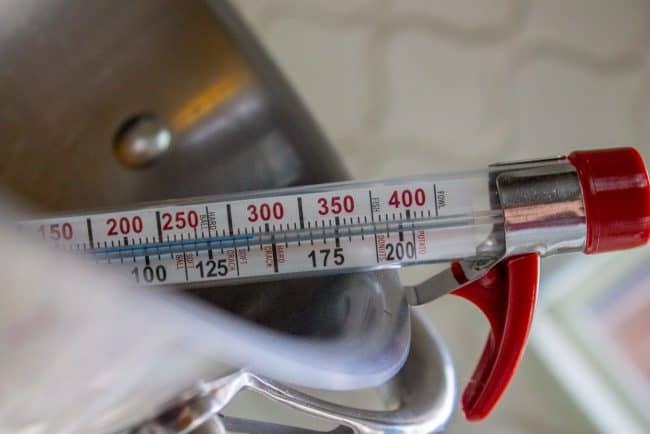 Do you always use a thermometer? Do you judge by color? Maybe try sticking with the thermometer if you are having inconsistent results. I will double check with the candy makers in my family! Just tried your recipe when it got to 250 degrees the butter started separating from the mixture. Any ideas? Hey Kathy, I haven’t had that happen to me before. How did it turn out?